Exp-TickSniper - scalper de alta velocidade com seleção automática de parâmetros para cada par de moedas automaticamente. Você sonha com um consultor que irá calcular automaticamente os parâmetros de negociação? Automaticamente otimizado e ajustado? Apresentamos-lhe o nosso novo desenvolvimento para o mercado Forex. Este é um escalonador de ticks para o МТ4 e o МТ5 - TickSniper . O EA foi desenvolvido com base na experiência adquirida em quase 10 anos de programação de EA. Basta iniciar o EA na sua conta. Fará o resto. A estratégia da EA funciona com qualquer símbolo. O robô é baseado em cotações atuais, velocidade de chegada do tick, tamanho do spread e outros parâmetros de especificação do contrato. O sistema define automaticamente os níveis favoráveis de stop loss e take profit, bem como as distâncias das posições médias, a distância de parada móvel, etc. O EA aplica o sistema de abertura adicional contra uma tendência ("Média"). Suas configurações foram otimizadas ao longo do teste em nossas contas reais. O Expert Advisor pode trabalhar em qualquer par de moedas. Todos os parâmetros do sistema de negociação são calculados automaticamente e dependem do spread atual do par de moedas. As instruções completas são fornecidas em nosso blog . US $ 100 - depósito mínimo, mas eu recomendo de US $ 1000! O depósito recomendado é de pelo menos US $ 1.000 com o lote mínimo de 0,01 para três pares de moedas (por exemplo, EURUSD, USDCHF, USDJPY) ou uma conta de centavos com pelo menos US $ 100. Ele funciona no par de moedas, o qual gráfico está anexado. Recomenda-se um spread flutuante. Um spread zero é proibido! a função de média e abertura adicional. A posição acumulativa (uma série de posições abertas) tem seu stop móvel. Se a posição ou a série de posições entrar em lucro, o EA definirá um ponto de equilíbrio. Se o preço for revertido, essa posição é fechada por ponto de equilíbrio. O EA calcula o spread com base na média dos últimos ticks. Antes de comprar, faça o download da versão de demonstração e anexe-a a uma conta demo ou real com USDJPY. O EA não funciona em todos os corretores! Depende da velocidade das cotações no terminal. Você pode baixar a versão demo. O EA não funciona no testador de estratégia devido à velocidade de cotação. Verifique o sistema no gráfico real. A operação de EA é baseada no aumento ou diminuição do spread, bem como na taxa de cotação, portanto, pode mostrar resultados diferentes em corretores diferentes. O EA é totalmente automatizado. Atenção! Todos os parâmetros são definidos por padrão! Estes são os parâmetros ótimos e não são recomendados para reconfigurá-los! Trade_by_BUYSELL_Separate - negocie em ambas as direções simultaneamente. Permite negociar a compra e a venda ao mesmo tempo. I have had the TickSniper for a month and my account is up a little over 20% even after a big hit today and because the averager was implemented there are 4 additional position that can result in a hit but I will let it play out. I notice that there was an update issued. How do I update my existing application that is installed on my system. Good afternoon everyone! This product and its creator deserve 6 or more stars, we open separate accounts of BUY and SEEL with 7 pairs at 37K each and a profit of 1.5% / day, we are a little high risk, but who is not risking? Traders with this firepower cost 20 times more !!! Excellent EA and highly recommended! Buyed 1 year ago, i can say this is a good EA. And since the hedging update, the results are better. Whit a good floating spread broker, you can expect 5 - 15 % per months safely. If i have a good advice, don't be too greedy : 0.01 lots \ 3-4 pairs \ 1000 $. I used for 22 days and the result is very slow but stable. I'm very satisfied for current EA, and for the good support that Mr. Andruschenko gives. The EA gives small and frequent profits, and its work is very conditioned by spread and delay between client and broker. - Very important to use it with a VPS with minimal latency from the broker server. - Test it with "Every tick based on real ticks", and possibly with "Execution" value near to your VPS-to-broker delay. - Better adjust settings for every specific currency you want to trade. If the pair you choose has spread less than 10-15, the stoploss can occur. Adjust it to ensure no early exit (I set it to 0). - You will note large drowdown with respect to profit for every deal, but it is normal to ensure a large number of winning trades. Focus to the day profits, and to the account drawdown that is very limited. - Ensure that the VPS CPU usage is less than 100% to avoid delays as much as possible during operations. To accomplish this remove all the stocks not traded in market watch and all the charts not used. Very good EA and Vladislav gives the best support! I was with a bug and he connected via temviewer and made a lot of tests and something about an hour and a half later of hard working he did it! Solved my problem! Really really kind and attentive! 5 of 5 stars! Супер, отлично, лучше не бывает. Это слова. Сегодня первые торги, сами понимаете, торги не о чём. Но мне понравились. Excellent expert advisor (EA). It works as a scalper, performing quick operations, but which produces a greater probability of success. The technical support provided by Mr. Vladislav Andruschenko is also excellent. He provided all the necessary technical support to enable the TickSniper EA to work in the MT5 account of the broker, which I have an account with. The EA must be tested in the "every tick" mode. However, since the strategy tester does not produce floating spread, the adjustment of the parameters related to the signal (signal options) must be checked and improved in a real account. The EA is sensitive to delay (latency) in data transmission to the broker, so the same EA running with the same parameters, but on different computers, can generate different performance results in real accounts. As a suggestion for improvement of TickSniper EA, I propose to implement the calculation of the real profit discounting brokerage expenses (applicable to the negotiation of future contracts), for use in the "custom max" criterion of optimization for the backtests. In this case, it will be necessary to define two additional parameters for the calculation of the real profit: cost per contract; and cost per order. Купил, пока за неделю результаты неплохие. Впс правда загружает, но он самый дешевый и там 7 терминалов стоит, нужно наверное помощнее брать и отдельно ставить, как советуют здесь. 1. Советник действительно получился рабочий (8-12% в месяц), при соблюдении правил 0.01 лота на каждые 1000 usd (3-4 валютные пары). Не стоит вмешиваться в работу советника(он полностью автоматический),однако контролировать и обновлять советника на графиках обязательно стоит. Просадка на счете за все время не превышала 20%. Можно использовать более 4 валютных пар одновременно, но должен быть запас средств. 2. Автор очень адекватный человек, техническая поддержка на высоте, на любой вопрос получаю быстрый и вразумительный ответ (за что Владиславу отдельное спасибо). Постоянное обновление версии советника, благоприятно сказывается на безопасности и результативности работы советника. 3. Советник открывает сделки в зависимости от скорости тиков, поэтому желательно чтоб терминал с советником был один на ВПС. Тариф ВПС лучше выбрать более шустрый. 4. Можно использовать два графика на одну валютную пару (первый ONLY_BUY, второй ONLY_SELL).У многих брокеров на основных валютных парах есть по 2-3 дублирующих валютных пары с индексом "m". Например для eurusd есть возможность выбора eurusd.m., eurusd.m1, eurusd.m2. 5. В советнике есть множество настроек, однако увеличение прибыли прямо пропорционально росту просадки. Не нужно жадничать и гоняться за большими процентами, лучше сосредоточиться на стабильности и минимизации просадок на счету. Я использую настройки по умолчанию. Однозначно могу сказать, что советник достойный и стоит своих денег!!! 4. Можно использовать два графика на одну валютную пару (первый ONLY_BUY, второй ONLY_SELL). Perfect EA for scalping. you can EA setting optimize with a lot of parameters. I have deposit of 10'000 $ and 3 currency pairs they work with EA. With a lot of 0.1 per pair the EA makes 50-350$ profit per day. But i'm sure it's possible to optimize the setting even more better. Support by Vladislav is perfect and very fast. If you find a bug or you have a good idea to improve EA, he will done as soon as possible. I testing this EA for three weeks and i need to say its very risky EA, position holding time over a week eurusd with drowdown about 150€ on 800€ deposit and finaly profit 1,7€. In three weeks i have profit 13€ -49$ rent price. One Deposit of 250€ was burned in 2 days, maybe my mistake, because the lot was to high 0.05. This ea maybe would work good on a big deposit about 10K. 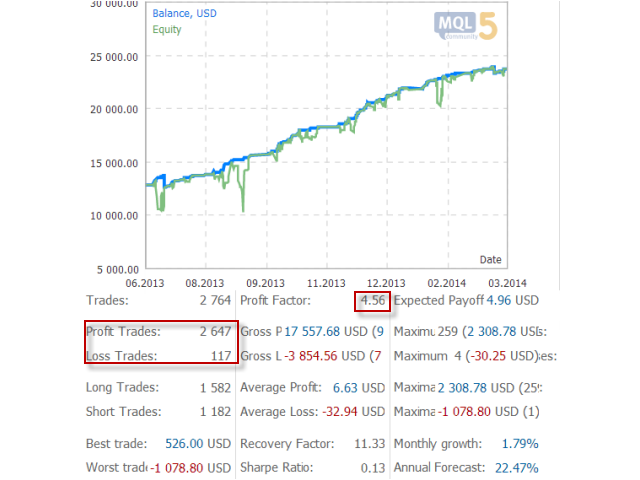 This EA is excellent, one of the best for MT5 MQL community. He is a scalper is a tick, so not recommended tester MT5 strategies. Best test in demo account (have a demo version of EA). Recalling that the connection latency is critical; the lower the latency will be best results. The author also has been very attentive, accepting suggestions and answering questions quickly. Five stars for the product and the technical assistance of the author. the test before and after use in real progressing well , according to the rules specified by the author . Excellent service. EA is calculating speed of ticks and adapts to spread to open positions. In case of losses - it is using averaging to anyway close any order with profit. Martingale is also possible, its optional. Averaging and martingale can require a lot of balance for support, so it better to have at least 1000 usd on balance for each 0.01 starting lot, or even more. I have tried to use stop losses instead of averaging, but this was not best decision, because all profit was lost to stoplosses, and balance started to slowly go down. Maybe its only relevant for my broker, I am not sure. 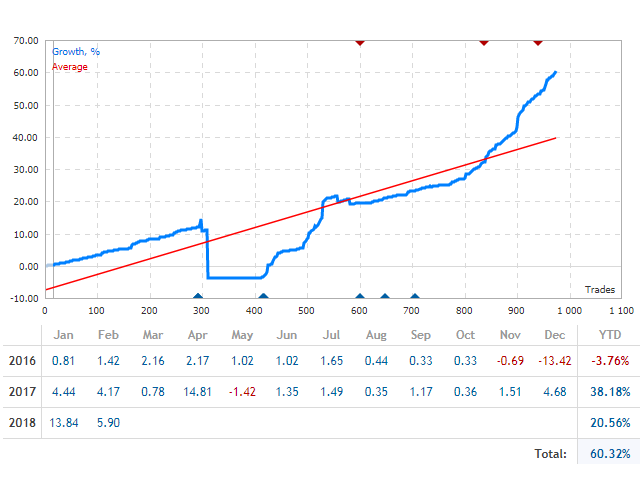 Anyway, averaging without stop losses and without martingale gives around 50-100 usd profit each month for 0.01 starting lot, my broker is Activtrades. I cannot recommend any stable symbol for trade right now, you can use MT4 version of this EA to do some tests with 99.9% tick quality for estimated results. But test should be done for broker with fixed spread, otherwise testing results will be incorrect. Tester in MT5 cannot give any reliable results for this EA at all, because it is not intended for testing of scalper EAs. Советник определяет скорость тиков и адаптируется к спреду, и на основе этих данных открывает позиции. В случае если позиция убыточна - применяется усреднение чтобы вывести любую позицию в доход. Можно использовать также мартингейл, он опционален. Усреднение и мартингейл могут привести к большой просадке equity, поэтому желательно иметь в запасе хотя бы 1000 usd баланса на каждые 0.01 начального лота. Я пробовал использовать стоп лосс вместо усреднения, но это в среднем приводит к убыткам. Усреднение без стоп лосса приносит около 50-100 usd в месяц при начальном лоте 0.01, мой брокер Activtrades. Я не могу рекомендовать символы со стабильным доходом, но можно использовать MT4 версию этого советника для теста с качеством тиков 99.9% чтобы оценить прибыль и убытки по любому символу, брокер при этом должен иметь фиксированный спред, иначе тестирование будет давать неверный результат. Тестер в MT5 не может дать достоверный результат для этого советника, потому что MT5 тестер не предназначен для тестирования советников-скальперов. Manual setting of the minimum average spread so that all parameters of the adviser are brought to this average spread. If the average spread on a currency pair is lower than 10 pips, then the adviser takes the value of the average spread ( AverageSpread ) as 10 pips, and all system parameters work from an average spread of 10 pips. If the average spread calculated by the advisor is more than 10 points, then the advisor takes the average spread = the calculated value. A new CUSTOM mode has been added to the LimitType type. You can specify your monitoring values ​​in minutes, the LimitForCustom_Minutes parameter. - Added the ClosingPositionAtASpecificTime parameter = close all positions at a certain day and time. This means the EA closes all open positions at 20:00 on Friday. - Attention: Typos have been fixed in some parameters. Check your settings if you changed them. Added automatic checking and normalization for all stops to tick size on the current currency pair. Added function that allows simultaneous trading in both directions. Trade_by_BUYSELL_Separate - when enabled, two directions are traded separately from each other - BUY and SELL orders are processed separately. Added the ClosePosifChange parameter - closing position by opposite, once a signal for changing direction appears. Attention: This parameter should be activated with caution and only when necessary. When this parameter is enabled, the averaging algorithm stops working correctly! Added check of margin requirements for the brokers, with which the current balance and the margin are updated daily. The Expert Advisor works on hedging and netting accounts. Improved trailing stop and stop loss modification. Changed the operation of Stop loss\Take profit modification with floating spread. For brokers, who do not accept too frequent modification requests. Improved the averager operation. The averager operation is filtered by current prices. (If you want to open an averaging order and MA is above the buy price, the averaging order is not opened). Set the default for MaxOrders = 5. The maximum number of averagings for the position = 5. New parameter Slippage - slippage in points during deal opening. If a server returns a requote on a signal, the deal will be omitted. Algorithm for determining a trend - location of MA relatively to the price. The MA period parameter is included into PeriodFilterMa settings. HoursSleepEaAfterStopLoss=0 - hours to wait before opening a new positions after closing a deal by stop loss. Added ability to disable Take Profit. When TakeProfitTickSpred=0, Take Profit is not specified. Fixed error of deal opening, if the last deal is not found in history. Added an option to calculate average spread used for calculation of parameters and trading. As a result, fast changing spread does not affect trading and false signals. There are less false signals during testing. TimeToCheckAverageSpread=8000 - time in milliseconds to calculate average spread.